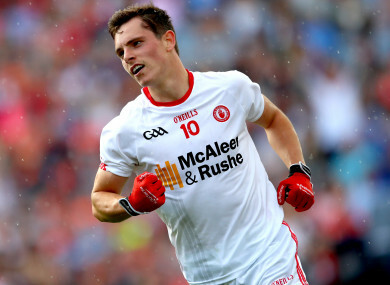 MICKEY HARTE HAS named the Tyrone team to play Dublin in Sunday’s All-Ireland SFC semi-final, making just one change from their quarter-final victory over Armagh. David Mulgrew, who scored 2-1 in an impressive display against the Orchard County after coming on as a substitute, replaces Declan McClure in the Tyrone attack. Sean Cavanagh will make his 89th championship appearance for the Red Hand, higher than any other outfield player in history. Dublin are expected to name their team on Friday night. Email “Tyrone make one change for Dublin as David Mulgrew's 2-1 off the bench gets him the nod”. Feedback on “Tyrone make one change for Dublin as David Mulgrew's 2-1 off the bench gets him the nod”.